Ask.com has launched Ask3D, a revamp of its search engine, which delivers results from a range of media types, as well as offering a new method of navigation. The makeover for Ask.com comes soon after Google introduced its Universal Search, which also displays a variety of media types in its search results – the example below returns video and images results. Unlike Google’s Universal Search, Ask segregates results into different content types, so image and video results are all shown together rather than mixed in with other results like Google. The search results are split into three columns, hence the name Ask3D – the left hand column displays Ask’s Zoom Related search, which suggests related queries to help users refine their searches. The middle column shows the search results, with a binoculars feature which previews the web page and gives you information on load time, and whether the site has pop-ups or is Flash-based. The right hand column displays video, images, music, recent related news and other media types. Ask has been busy marketing itself recently, with a guerilla style campaign to encourage users to try a new search engine, as well as championing its algorithm. The company plans further improvements to its search engine, to make the results more comprehensive. Ask has a 5% share of the search engine market in the UK, according to Hitwise stats, and a similar share of the US market. Any decision on a website’s navigation is critical to usability, findability, accessibility and SEO. It can be difficult to undo if you select a poor design. So usable navigation is best established early on in a web project. There are many different examples of main navigation systems, (i.e. the main method for accessing content in different site sections) but the ‘three Cs’ of convention, consistency and context are important whatever the design. 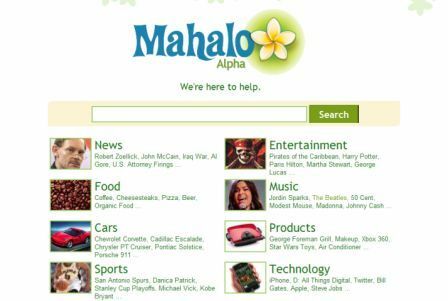 Mahalo is a new human-powered search engine, brought to you by Weblogs Inc founder Jason Calacanis, which went live today in ‘alpha’ test mode.